Having purchased DJI’s Spark earlier this summer, and having had the opportunity to create with it in Asia, South America and Europe – I now feel ready to share a few of my thoughts. The almost-pocket-sized bit of kit doesn’t dominate a backpack, or worse require it’s own specialist backpack – making it ideal for days out, and very suitcase friendly. For people wondering, “but, do I have the skills?” – which is most definitely something I was mindful of. It’s hard to explain just how easy it is. 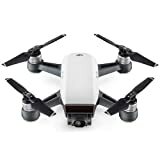 For the first month, I was without the DJI Spark Remote Contoller, this meant flying with just a smartphone or tablet. When I then made the upgrade to the joystick wielding remote, the user experience was increased vastly, making flying very simple. For a first-time buyer, like myself, I couldn’t recommend the Spark more. Drop any questions in the comments down below! Click on the Spark to see it on Amazon. The spark comes with one 1480 mAh battery, enabling “16 minutes of flight”. This is a tip that I’m yet to follow, but I would say, had I a spare, I would have been able to do a lot more with specific day trips or locations. This being annoyingly emphasised every time the sun sets, and I’m all out of juice. If all else goes wrong, or for any reason you would prefer to physically pluck your Spark from the air, you can. Carefully approach the drone from underneath, and simply flip it upside down. This instantly cuts out the motor. The remote controller enables “Sport mode” (essentially making it go completely bonkers, increasing the top speed to 31mph). With a friend, I took the drone out to a private spot, and the rest is history. A lesson learnt. You can see some short films created out in Thailand, South America and Serbia below. PS. In all of my material I have been lucky enough to use the music of German artist, Flughand. You can see our in-depth interview with him here. <Fly in Thailand> ———————— *To watch full video, click the link in my bio* – So… here it is. Creating in this form is new to me. I'd really love to know what you all think. – Drop a "🚀" if it makes you want to travel. – A HUGE shoutout to my friend Flughand (@flughand) for allowing me access and usage of his upcoming EP – this video features song "Canjuu". Go and show him some love on Apple Music/Spotify!!! — This video made entirely using @djiglobal's Spark. . . .